A joint project between the Manufacturing Engineering group and the Department of Pathology has led to the successful commercial development and marketing of automated equipment. The vision-assisted robot transfers minute colonies of bacteria from agar plates to test-tubes, thus transforming a job that would be performed manually over a period of weeks to an automatic process taking only a day. 'This is a great example of how an idea originating within the University can be developed right through to the end product,' enthuses Dr Thomas Bligh. The idea came to Dr Bligh after seeing the manual colony-picking process in action. The BioPick fully automated colony-picking robot. A fourth-year undergraduate was placed at Addenbrookes to carry out the concept work for the programme. 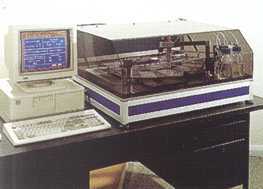 Advanced image analysis techniques were then developed to identify colonies, and a prototype was developed for Dr N Affara of the Department of Pathology. Collaboration with biologists was essential at all stages, to determine the requirements and specifications of such a machine. The end product is the BioPick, manufactured and marketed by BioRobotics Ltd, a small company set up by Dr Bligh, colleague John Vince and CUED graduate Martin Davies, based at Comberton, near Cambridge. The BioPick is a compact, bench- top machine (space is always at a premium in any biological laboratory), manufactured using the latest techniques in CAD/CAM (instructions for the machining of the component parts can be sent directly to the shop floor by modem). Advanced image-processing techniques are used to identify colonies of interest. 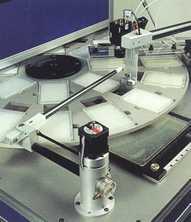 An extremely accurate carbon-fibre robotic arm positions the picking needle exactly over each colony and transfers it to a micro-titre plate. Picking rates of up to 1,000/hr are possible, and 10,000 colonies can be picked in one set-up. The carbon-fibre robotic arm takes colonies from a bioassay plate to micro-titre wells on the turntable. The machine has found immediate application in the human genome project, which is a worldwide collaboration of biologists aiming to define the complete structure of DNA, and has obvious applications in any laboratory where a large number of cultures have to be systematically analysed. This must rate as technology transfer at its best. Further details from Dr Thomas Bligh on (01223) 338198.